Today I announced some changes in the Defense Department’s policies regarding transgender servicemembers and I want to explain why. There are three main reasons — having to do with our future force, our current force, and matters of principle. The first and fundamental reason is that the Defense Department and the military need to avail ourselves of all talent possible in order to remain what we are now — the finest fighting force the world has ever known. Our mission is to defend this country, and we don’t want barriers unrelated to a person’s qualification to serve preventing us from recruiting or retaining the soldier, sailor, airman, or Marine who can best accomplish the mission. We have to have access to 100 percent of America’s population for our all-volunteer force to be able to recruit from among them the most highly qualified — and to retain them. While there isn’t definitive data on the number of transgender servicemembers, the RAND Corporation looked at the existing studies out there and their best estimate was that about 2,500 people out of approximately 1.3 million active-duty servicemembers and about 1,500 out of approximately 825,000 reserve servicemembers are transgender, with the upper end of their range of estimates of around 7,000 in the active component and 4,000 in the reserves. This brings me to the second reason, which is that the reality is that we have transgender servicemembers serving in uniform today, and I have a responsibility to them and their commanders to provide them both with clearer and more consistent guidance than is provided by current policies. I and the Defense Department’s other senior leaders who have been studying this issue over the past year have met with some of these transgender servicemembers — they’ve deployed all over the world, serving on aircraft, submarines, forward operating bases, and right here in the Pentagon. And while I learned that in most cases their peers and local commanders have recognized the value of retaining high-quality people, I also learned that the lack of clear guidelines for how to handle this issue puts the commanders and the servicemembers in a difficult and unfair position. One servicemember I met with described how some people had urged him to leave the military because of the challenges he was facing with our policies, and he said he just wouldn’t quit. He was too committed to the mission and this was where he wanted to be. These are the kind of people we want serving in our military. The third and final reason for the change is a matter of principle. Americans who want to serve and can meet our standards should be afforded the opportunity to compete to do so. After all, our all-volunteer force is built upon having the most qualified Americans. And the profession of arms is based on honor and trust. In view of these three reasons to change our policy, last July I directed the commencement of a study to identify the practical issues related to transgender Americans serving openly, and to develop an implementation plan that addresses those issues consistent with military readiness — because our mission, which is defending this country, has to come first. It’s fair to say it’s been an educational process for a lot of people here in the Department, including me. We had to look carefully and deliberately at medical, legal, and policy considerations that have been evolving very rapidly in recent years, and we had to take into account the unique nature of military readiness and make sure we got it right. I’m proud of the thoughtful and deliberate manner in which the Department’s leadership pursued this review. I have been guided throughout by one central question: is someone the best qualified servicemember to accomplish our mission? The leadership of the armed services — together with personnel, training, readiness, and medical specialists from across the Department of Defense — studied the available data. We also had the RAND Corporation analyze relevant data and studies to help us with our review. And we got input from transgender servicemembers, from outside expert groups, and from medical professionals outside the Department. We looked carefully at what lessons could be learned from the outside, including from allied militaries that already allow transgender servicemembers to serve openly, and from the private sector, because even though we’re not a business, and are different from a company in important ways, their experience and practices are still relevant. It’s worth noting that at least 18 countries already allow transgender personnel to serve openly in their militaries. These include close allies such as the UK, Israel, and Australia, and we were able to study how they dealt with this issue. We also saw that among doctors, employers, and insurance companies, providing medical care for transgender individuals is becoming common and normalized — in both public and private sectors alike. Today, over a third of Fortune 500 companies — including companies like Boeing, CVS, and Ford — offer employee health insurance plans with transgender-inclusive coverage. That’s up from zero companies in 2002. Similarly, non-discrimination policies at two-thirds of Fortune 500 companies now cover gender identity, up from just 3 percent in 2002. 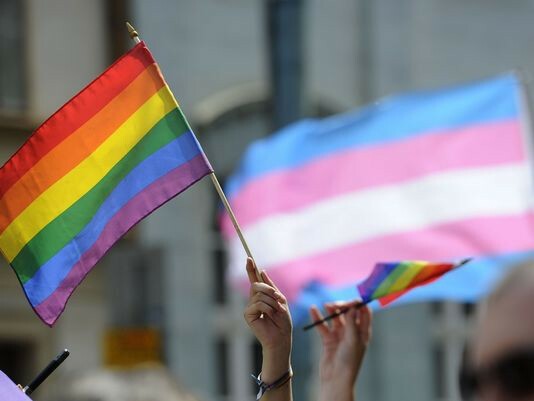 And for the public sector, all civilian federal employees have access to a health insurance plan that provides comprehensive coverage for transgender-related care and medical treatment. This represents a sea change from even just a decade ago. And in terms of cost, RAND concluded the health care costs would represent “an exceedingly small proportion” of DoD’s overall health care expenditures. As a result of this year-long study, I’m announcing today that we are ending the ban on transgender Americans in the United States military. 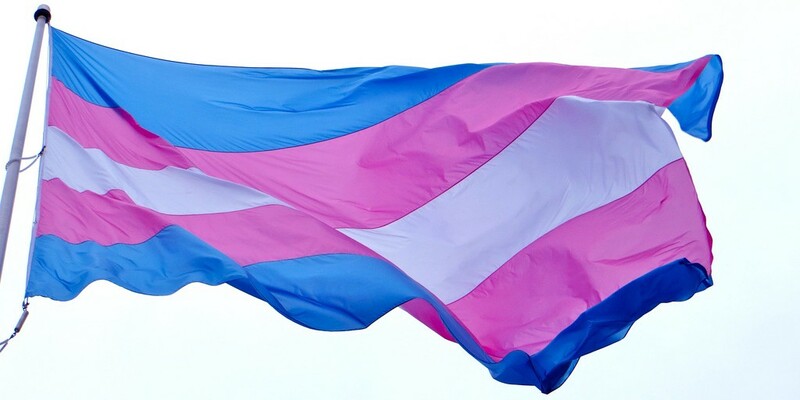 Effective immediately, transgender Americans may serve openly, and they can no longer be discharged or otherwise separated from the military just for being transgender. 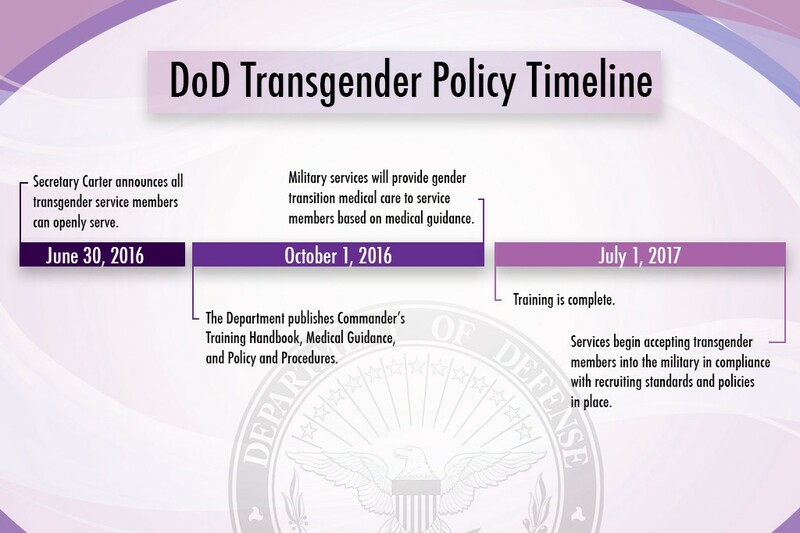 In taking these steps, we’re eliminating policies that can result in transgender servicemembers being treated differently from their peers based solely upon their gender identity rather than their ability to serve. And we’re confirming that, going forward, we will apply the same general principles, standards, and procedures to transgender servicemembers as we do to all servicemembers. What I heard from the transgender servicemembers I met with, overwhelmingly, was that they don’t want special treatment; rather, they want to be held to the same standards and be treated like everyone else. As I directed, the study identified practical issues that arise with respect to transgender service. And it developed an implementation plan to address those issues. These policies will be implemented in stages over the next 12 months — starting most immediately with guidance for current servicemembers and their commanders, and followed by training for the entire force, and then beginning to access new military servicemembers who are transgender. Implementation will begin today. Next, over the 9 months that follow, based on detailed guidance and training materials that will be prepared, the services will conduct training of the force — from commanders, to medical personnel, to the operating force and recruiters. When the training is complete, no later than one year from today, the military services will begin accessing transgender individuals who meet all standards — holding them to the same physical and mental fitness standards as everyone else who wants to join the military. I have discussed the implementation plan with our senior military leaders, including Chairman of the Joint Staff, General Dunford. The chiefs had specific recommendations about the timeline, and I made adjustments to the implementation plan timeline to incorporate those recommendations. The Chairman has indicated that the Services support the final implementation timeline that I’ve laid out today. I want to emphasize that deliberate and thoughtful implementation will be key. I and the senior leaders of the Department will therefore be ensuring that all issues identified in the study are addressed in implementation. I am 100 percent confident in the ability of our military leaders and all our men and women in uniform to implement these changes in a manner that both protects the readiness of the force and also upholds values cherished by the military — honor, trust, and judging every individual on their merits. I’m also confident that we have reason to be proud today of what this will mean for our military — because it’s the right thing to do, and it’s another step in ensuring that we continue to recruit and retain the most qualified people — and good people are the key to the best military in the world. Our military, and the nation it defends, will be stronger.